After an introduction to how ice forms and how it can be assessed, followed by discussions of the hazards posed by ice environments, how to mitigate them, and the human elements of decision making, you'll get kitted out in a drysuit, PFD, and all sorts of specialised gear. 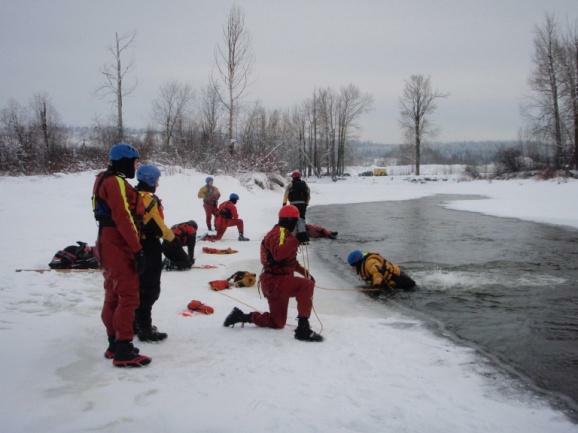 We'll have you practicing a variety of self rescue techniques, buddy-rescue techniques, ice travel techniques, and get you thinking about how you can incorporate safer work practices into your profession. The price is $375 per participant; register by March 13th. Includes E-Learning theory module, to be completed prior to the 21st. PPE daily rental and shipping are additional costs... email us for more details or to arrange for invoicing or over-the-phone registration!